The full name of Alex Rodriguez is Alexander Emmanuel Rodriguez. Alex Rodriguez is the highest paid baseball player in 2011 from America with a annual income of $32,000,000. Alex Rodriguez is a American professional baseball player. 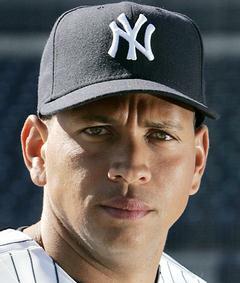 Alex Rodriguez was born in the year 1975 July 27 at New York city. Alex Rodriguez had hit 629 home runs in his career. The nick name of Alex Rodriguez is known as A-Rod who is more famous in that name. Alex Rodriguez holds the record of Youngest player to hit 500 home runs in a baseball career. Alex Rodriguez started his career in the year 1994 where he played for Seattle Mariners. From 2001 to 2003 he played for Texas Rangers and from 2004 onwards he is playing for New york Yankees which is his current team. In 2003 Rodriguez become most valuable player in American league. Rodriguez is the 7th baseball player to hit 600 home runs in a career and youngest player to hit 600 home runs. In 2002 Rodriguez married Cynthia Scurtis and have two children named Natasha Alexander and Ella Alexander.